THE AVERAGE PRICE of a house in Ireland is more than 7% higher than this time last year and more than 50% higher than five years ago. According to the latest Daft.ie quarterly house price report prices in Dublin rose more that 8% last quarter. The average house price in the capital now stands at €368,356, an increase of €145,000 on their lowest point in 2013. Last quarter saw prices rise in 53 of the 54 markets covered, with only Monaghan recording a slight fall. Compared with prices a year ago, only Donegal has seen prices drop. The report cites a continuing lack of supply as the reason for prices continuing to rise. There were just over 20,000 properties on the market in March as the number of properties available to buy nationwide continues to fall. There was some good news in Dublin where the number of listings increased significantly - up from 2,700 a year ago to 3,500 now – however that was largely offset by a fall in availability elsewhere. The number of properties available outside of Dublin dropped by 1,000 to 16,800. That figure is the lowest on record since Daft started tracking supply in January 2007. 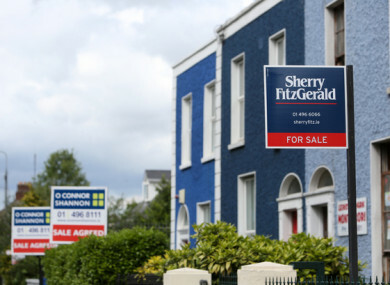 “The picture of the housing market in Ireland currently remains one of strong demand and very tight supply pushing up prices,” Trinity College Dublin economist Ronan Lyons, who authored the report, said. Lyons said there are some causes for people to be cautiously optimistic. These include an increase in transaction volumes countrywide and in the rise in houses for sale in Dublin. “Nonetheless, during a five-year period when consumer prices did not change, housing prices rose by 50%. This is an indication of how inadequate housing supply is,” he concluded. The report noted that interest and activity amongst property hunters remains very high with an average of over 1,000 searches taking place every minute on Daft.ie. Discussing the findings Lyons said Ireland is in the middle of a century-long process of moving from rural households occupied by roughly four people to an urban society with two people in each household. To address this demographic shift supply needs to be built up around cities – and predominantly in apartment form. However that is simply not happening. Planning permission was only granted for approximately 5,000 apartments, nationwide, last year, and for only 20,000 dwellings in total. Lyons says this is less than half the likely demand. “It is often said that the mantra in the housing market is ‘location, location, location’. For housing policy in Ireland, it needs to be ‘supply, supply, supply,’” the economist concluded. Email “The average house price in Dublin is €145,000 more than five years ago”. Feedback on “The average house price in Dublin is €145,000 more than five years ago”.